There is something in common between Amr Khaled and Muhammad Hamid. Both are indebted to Yasmin al-Husary, the daughter of the renowned Quran reciter, Mahmoud Khalil al-Husary (the first person to recite the Quran in the US Congress and the United Nations ). She is the person that provided both of them their very first platform and megaphone, by which they became known to thousands. Yasmin Al-Husary graduated from Cairo University in Philosophy and Psychology and started her career working in the Egyptian Parliament. Her musical talent was recognized and she began a career as a singer after graduating from the Academy of Art. It is said that she became really popular after Um Kalthoum died and that President Sadat used to attend her concerts. However after the death of her father she quit singing and dedicated her life to charity work and spearheading an NGO and foundation established in her father’s name. In that sense, if we were to analyze Muhammad Hamid as a prototype of a new kind of Egyptian politician, and Amr Khaled as an earlier step in that evolution, then we must pay attention to the feminine nurturing mentorship and guidance received from Yasmin al-Husary. Perhaps it is significant that a woman was the person who propelled them both into the spot light and provided the financial means and institutional framework for them to reach thousands of people. Her discourse and priorities must have been different than your average post-colonial Islamically inspired politician or activist (I can’t help but insist). There must have been a positive feedback of sorts, she chose Amr Khaled and Muhammad Hamid because of their inclinations, and they chose her because of her vision and infrastructure. I have personally witnessed both men pay tribute to her and express how indebted they were to her. Both instances where at the Al-Husary Mosque in 6th of October City where I lived. Speaking of which, the Al-Husary Mosque was such a power-house it literally had an impact on the entire still-new city in the early 2000s. Amr Khaled used to attract thousands of young Egyptians to this mosque to attend his lessons. Muhammad Hamid used to attract hundreds, which is as impressive if you keep in mind that his lectures were of an academic and technical nature, as opposed to Khalid’s motivational and personal-development themes. We used to joke that everyone in 6th of October City was now memorizing Quran thanks to Shiekh Hamid! I recall the first time I encountered a Amr Khaled lesson. I was heading back home from the lab. It was the first night of Ramadan, and in a city as new as 6th of October there was no such thing as a traffic jam. But there it was, a trail of hundreds of double-parking cars for nearly a mile leading to the Al-Husary Mosque. I couldn’t help but get off to see what attracted all these people (I had to get off because the bus wasn’t moving!). I walked into an over-flowing mosque that was still under construction. Amr Khaled was giving the first Ramadan lecture. It was full house each and every night. That was when my religious awakening occurred. 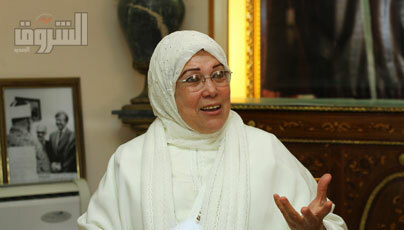 Yasmin Al-Husary is the lead figure behind that mosque project and the reason why Amr Khaled was there that night. Muhammad Hamid has studied religious topics under numerous scholars (he has a license that demonstrates that he memorized the entire Quran in all its variant recitations, which is a major achievement. It is further impressive that his license of the highest type possible). Yasmin al-Husary may not be a religious scholar, but she certainly has played a role in where he is today. What I would like to understand is whether Muhammad Hamid’s trajectory towards liberal politics is a guided one, or if he experienced a sharp-turn due to some type of disenchantment/enlightenment or disillusion. Both alternative scenarios are relevant. If guided and foreseen, then it points to a genuine and authentic articulation of liberal politics from within the traditional Islamic framework. Enabling this may be three characteristics Yasmin Al-Husary combines. 1) She expresses an orthodox/traditional religious practice. 2) She is from amongst Cairo’s upper class and could be described as one of Egypt’s female elite. Due to her father’s mega-stardom and her work in the Parliament, she has interacted with politicians, and not only rubbed shoulders with the Jehan Sadat and her caliber, but is of that caliber. She is also at the pinnacle of Egypt’s religious female elite: upper class women, either by virtue of family wealth, politics or stardom, who at the same time are religious (either because they are from religious families or had a religious awakening and left the entertainment business). 3) the third characteristic is that she comes across as a worldly and strong woman (again, she was a popular singer in the 70s and 80s). So she therefore has religious currency, wealth, status, and a vision from above that many politicians and activists do not. That combination may be a reason for her to want to promote a more liberal, yet authentic interpretation of Islam and did so by helping those who share that vision reach more people. It seems that if one were to study the emergence of Muhammad Hamid (and his anticipatory Amr Khaled), it must be preceded with an extensive study on Yasmin Al-Husary and the combination of respect of the Islamic tradition, social development, wealth, and the maternal/feminine touch. I leave you with one of her most famous songs. A song in the praise of Prophet Muhammad (peace be upon him). Muhammad Hamid, and the prototype to be reckoned with.